Robert Zend is unquestionably Canada's most musical poet. Canada and poetry have cause to be thankful. Zend IS. Zend is HERE. [Zend's] poems display a ready wit and frequent flights of fancy. In Beyond Labels the poet shows more formal ingenuity and invention [than in From Zero to One], especially with his "Ditto poems" and "Drop poems," which are reminiscent of concrete poetry. This book also includes the poet's address to Amnesty International, which discusses the destructive compulsion people feel to label others. Very sincere and moving poems. I love your poems, especially those which you dedicate to me. y'r a marvlus word tamer miracle, wundrer uv. Knowing your poems I understand why you like mine. Robert Zend is a one-man literary renaissance. Zend does't write poetry; he breathes it. I can't understand why his poems are not translated into twenty-seven languages of the world! You are my friend because you are a Hungarian and a poet. Zend is so funny that we must take him seriously. Zend is a citizen of the universe. Zend is a great poet. He is my chosen brother. The answer to every reader's quest--the Living Zend. Zend is a split-personality and I love him both. Zend's poetry is whimsical, rare and much needed on this continent. His double-edged humour, like a splash of cold water in the face, wakes you up and it has a wonderful aftertaste. I had a very pleasant afternoon while reading your poems. Robert Zend's feet are planted in the ground, his heart is forgiving, his head is in the clouds. Between your poems and mine there is no iron curtain. "Ditto Poems cannot be read like ordinary poems. Because of the letters placed at random, they have to be scanned, like radar or TV tubes. The reader's eye has to follow the letters patiently, from left to right, line by line, top to bottom, with conscious concentration. To understand the poems, the reader must link the letters into words (every new word starts with a capital letter) and the words into phrases. Ditto Poetry is a reversed sort of poetry: the poet has the fun and the reader does the work." - John Robert Colombo in Beyond Labels, p. 86. Robert Zend and John Robert Colombo (Ditto poem), p. 112. 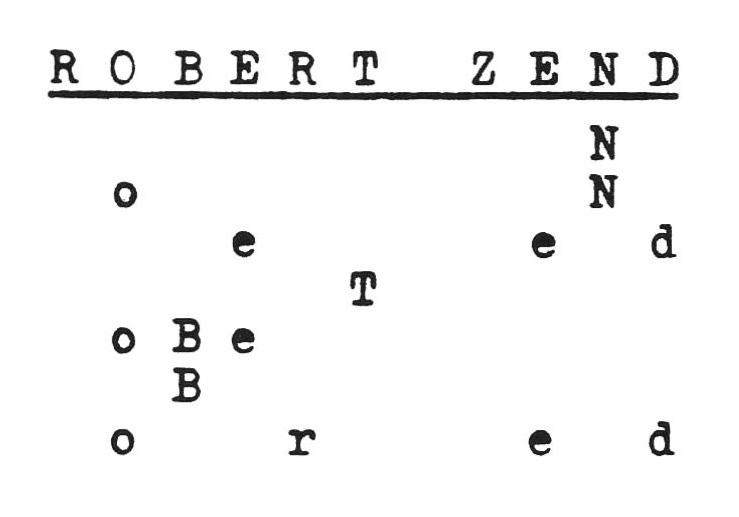 Robert Zend and John Robert Colombo (Ditto Poem), p. 113. "I invented Drop Poetry in 1982, as an off-shoot (improvement?) of Ditto Poetry. Its rules are tougher than those of its predecessor, both for the poet and the reader. Since the letters of the poem "drop" from the title, the poet can use each letter of the title only once, and only in the original order. The reader, on the other hand, has to read each poem twice: first the title (in two lines), then the poem (second line only). Thus, the possibilities are even more limited, and the discrepancy between the "title" and the "poem" is greater than in the Ditto poems." - Robert Zend in Beyond Labels, p. 116. Robert Zend, August 29, 1963, p. 51. "Dragonfly," by Julius Marosan, Janine Zend's private collection. Leopardi's "night song of a shepherd in asia"
"However, try as he might, he finds himself unable to experience the emotions that Leopardi associates with mortality: relief, remorse, unhappiness, and anxiety. As an antidote to Leopardi’s austere melancholia without the promise of paradise, he deploys an absurdly tautological argumentat to prove Leopardi’s obsessive theme to be meaningless: his problem is 'not death, but existence,' 'against which we have but one weapon: Life,' which, coming full circle, is in turn 'solved by death.'"